A jury in New Jersey awarded a couple $117 million dollars following arguments that the defendant’s product resulted in the plaintiff’s diagnosis of mesothelioma, a type of cancer. Other juries have found the talc powder manufacturer liable in cases in which the plaintiffs allege the Shower to Shower powder caused ovarian cancer when used for feminine hygiene purposes over a prolonged period of time. But this recent jury award is the first to order J & J to pay damages because of mesothelioma claims. J & J’s talcum supplier, Imerys Talc America, has said that they will appeal the verdict. Initially, the jury awarded $30 million in compensatory damages to the plaintiff, Stephen Lanzo III, an investment banker. His wife, Kendra, was awarded $7 million for loss of consortium. Following these announcements, jurors awarded the plaintiffs $80 million in punitive damages. Compensatory damages are intended to provide financial compensation for a plaintiff’s economic and non-economic damages. Punitive damages are intended to punish a company for acts of wrongdoing. Stephen Lanzo said that he had used the defendants’ talc powder products regularly for over 30 years before being diagnosed with mesothelioma. He alleged that the inhalation of the talc powder triggered the cancerous mutations to cells in his lungs. Specifically, Lanzo claimed the talc powder was contaminated with asbestos, which extensive scientific research associates with mesothelioma, a particularly aggressive and deadly type of lung cancer. It is thought that asbestos can contaminate talc during the mining process, since asbestos are often naturally located near talc deposits. The plaintiffs alleged that the defendants failed to warn consumers about the risks of asbestos in talc. However, manufacturers have been required for decades to ensure talc powder products do not contain asbestos, and Johnson & Johnson and Imerys have vigorously protested the claim that asbestos are present. The defendants have asserted that they routinely conduct extensive testing to ensure the absence of asbestos. But the plaintiffs countered that argument by claiming that the defendants exerted undue influence over the researchers, and that the tests used only detected asbestos over a certain threshold. In other words, the tests may not detect 100% of asbestos. This recent jury award is the latest defeat for the beleaguered manufacturer. 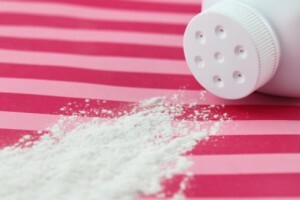 Recently, a judge upheld a $110 million talc powder award that had been appealed. These damages were awarded to a Virginia resident, Lois Slemp, who claimed that her ovarian cancer developed after years of talc powder use. There are still more than 6,000 talcum powder cancer lawsuits pending against Johnson & Johnson and Imerys. The majority of these product liability lawsuits are joined to the multidistrict litigation (MDL), which is proceeding before Judge Freda L. Wolfson of the U.S. District Court for the District of New Jersey. After the initial group of lawsuits goes to trial, any cases that are not resolved through settlement agreements will be remanded back to their home districts.